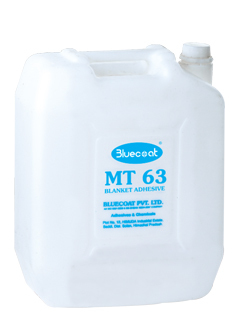 Bluecoats - 36 LT, 54 MT, 81 HT are colourless, liquid thermoplastic base blanket adhesive for the safe adhesion of fabric on the rubber blanket of flatbed & rotary printing machine. These adhesives are formulated to give tackiness at a specific temperature only. The adhesives are used either in combination or separately depending on the quality of cloth and temperature in working area. Bluecoat-36 LT, Bluecoat-54 MT & Bluecoat-8l HT are not affected by the usual printing auxiliaries frretain their adhesion and strength over a period of time. Always keep the container closed in a ventilated place. The materials are highly inflammable. Keep away from smoke, fire and other sources of ignition. Use protective gloves Er wear glasses for safety of eyes. Do not smell the material. Dispose the carbuoys after washing.